Not only do I answer questions each day at my own AsktheBuilder.com website, but I also do the same at another major internet Q-and-A site. Two days before Christmas I answered a most unusual question. The gentleman wanted to know the best books I’d recommend about building and construction for young architecture students. You might think my first reaction would be to provide a few links from Amazon.com to one or two top books. I didn’t do that. Instead I uploaded a photo I had taken the day before of a house being built near me and a short story. I drive by this house each time I go into town. About a week before Christmas the builder had completed pouring the foundation for an attached two-car garage. There are two separate garage doors in this structure. As often happens, the builders poured the garage foundation at a later date than the house foundation. Doing this allows better access to the house foundation forms for ready-mix concrete trucks. If you decided to pour both foundations at once, you might have to incur the cost of an expensive concrete pump truck. I decided to take a few photos of the garage, and once I pulled into the driveway I shook my head in disbelief. The two-car garage had a fatal flaw. 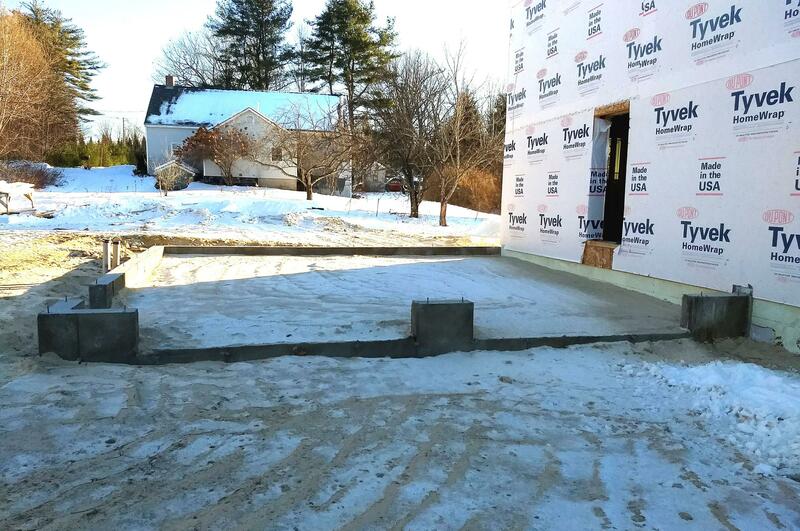 You need to know that the first floor level of the house is going to be about 2 feet higher than the garage floor. This means there has to be a minimum 3-foot by 3-foot platform that projects into the garage immediately adjacent to the door leading from the garage into the house. Two steps will get you from the platform down to the garage floor. The edge of the garage door that’s closest to the house is about 28 inches from the sidewall of the house. The platform is going to occupy space that was supposed to be for the car. Now that space will be adequate for at most a touring Harley Davidson motorcycle or a golf cart. My answer to the man asking about the books was that instead of reading about how to build, aspiring architects should just go work full time on construction sites for a minimum of a year. Two years would be a much better investment of time. This hands-on construction experience would pay off in spades later in their careers, allowing them to better serve their clients. I went on to mention how the young women and men should work for both remodeling and new construction builders. They’ll quickly discover the challenges faced by builders when trying to work from plans that contain flaws or oversights. About halfway through my career as custom builder and remodeler, I had a confrontation with an architect who was about my age. He had drawn the plans for a room addition I was building. I knew this architect had no field experience at all because it had come up in previous conversation. As I reviewed the plans before starting the job, I uncovered a design flaw that would no doubt cause a massive wood beam to rot years down the road. The wood beam held up one end of the addition over a new garage below the addition. The architect called out for a flat concrete block pier to be built for one end of the wood beam to rest upon. The top of the block pier extended about 6 inches beyond the face of the wall plane. I told the architect that rain water would pond on the pier and saturate the concrete block. This moisture would wick back to the wood, causing it to rot. He disagreed and demanded the top of the block pier to be flat for a particular look and feel. I protected myself with a written note to the owner so I would not be held liable when it rotted. She sided with the architect. I’m sure the beam has rotted by now. By working on construction sites, aspiring young architects would see how frustrating it is to work from plans lacking great details of complex connections, blueprints missing interior elevations, and AWOL room finish schedules along with minimal written specifications. All of these things lead to misunderstandings, drama, blown budgets and in the worst cases expensive lawsuits where only the attorneys win. If you know a person who expresses an interest in being an architect, please convince them to go get muddy, sweaty and dusty for two years. They’ll forever thank you!